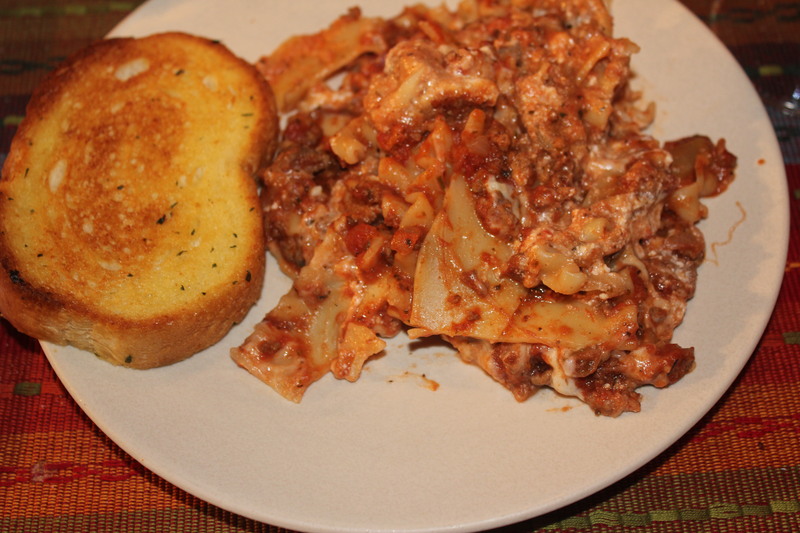 My recipe for “free-form” lasagna is based on Rachael Ray’s “lazy lasagna.” Lexi loves Rachael’s shows, and I happened to catch part of the one where she made this. 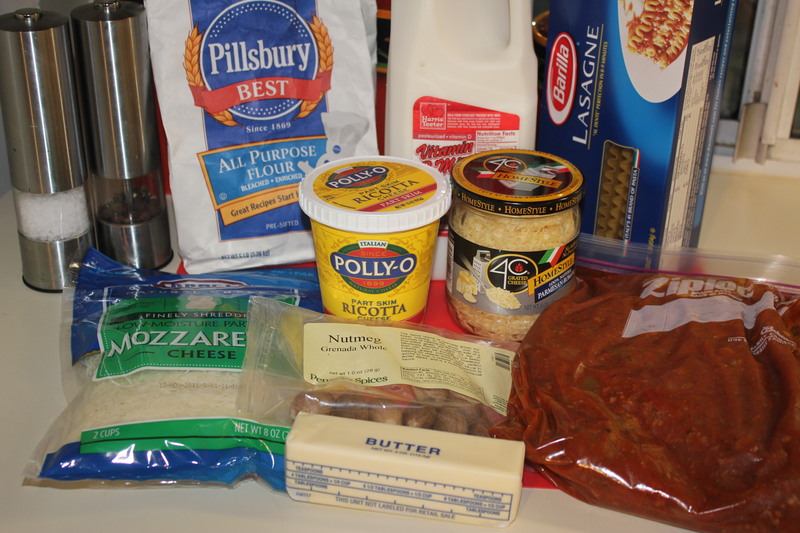 I remember thinking at the time that I wanted to try this since you don’t have to go through as much prep work as you do for a more traditional lasagna. There are a couple of major differences between Rachel’s recipe and mine. I add quite a bit more cheese than she does. 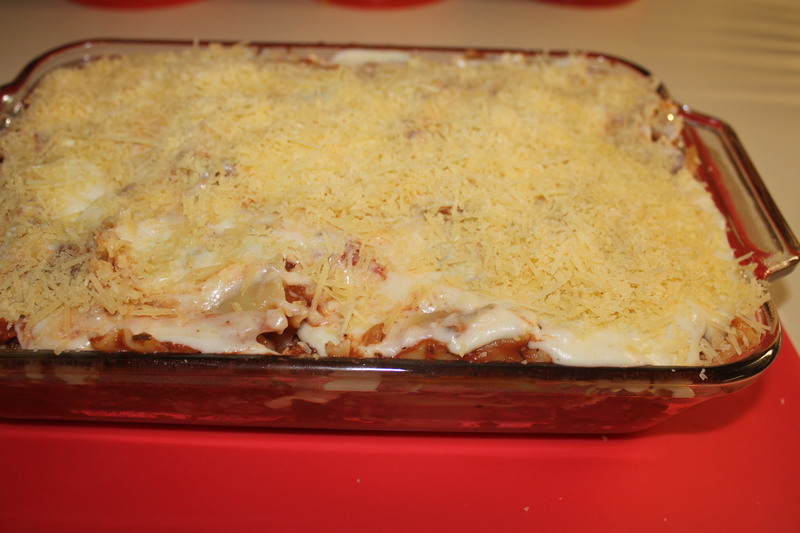 No offense, Rach, but for me that’s what lasagna is all about – the cheese. Also, I do not follow the directions for her sauce and instead make my own. I suggest you do the same if you have a sauce that you love. 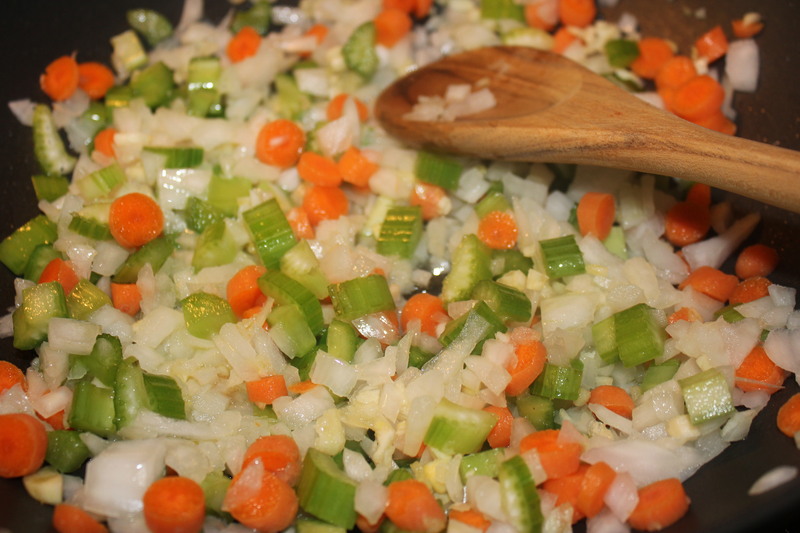 My sauce does take a while to prepare, and I like to make it at least a day before so the flavors can intensify. 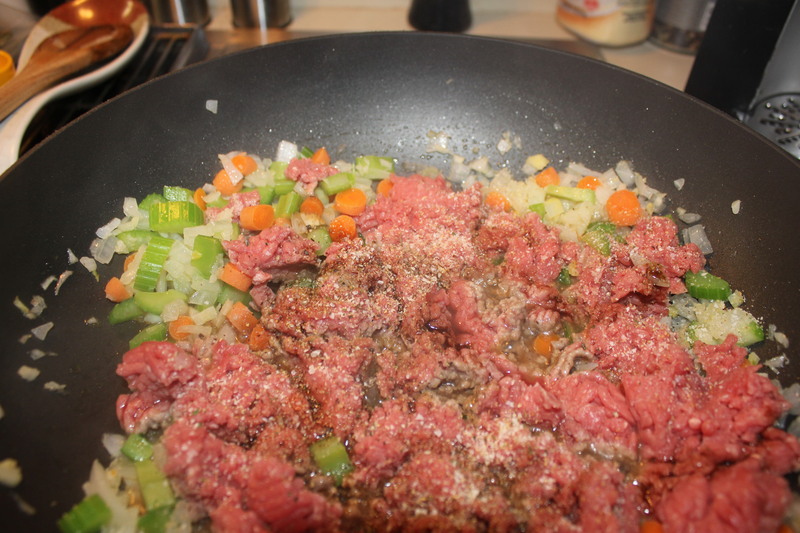 Add the ground sirloin to the pan and follow with the garlic salt, pepper and several dashes of worstershire sauce. 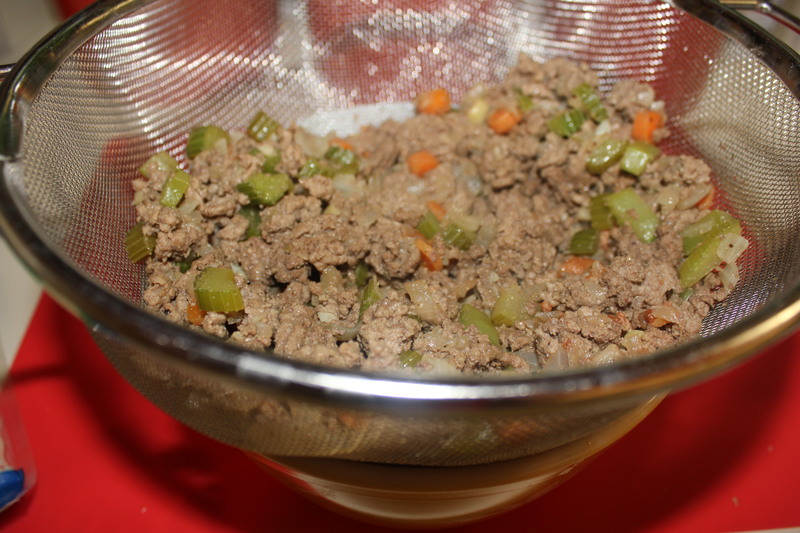 Stir until the meat has browned. Pour the mixture into a colander and drain well. In the same skillet, add the sweet Italian sausage and cook until brown. Make sure you break up the meat into small bite-sized pieces as you cook it. Drain well once it’s ready. 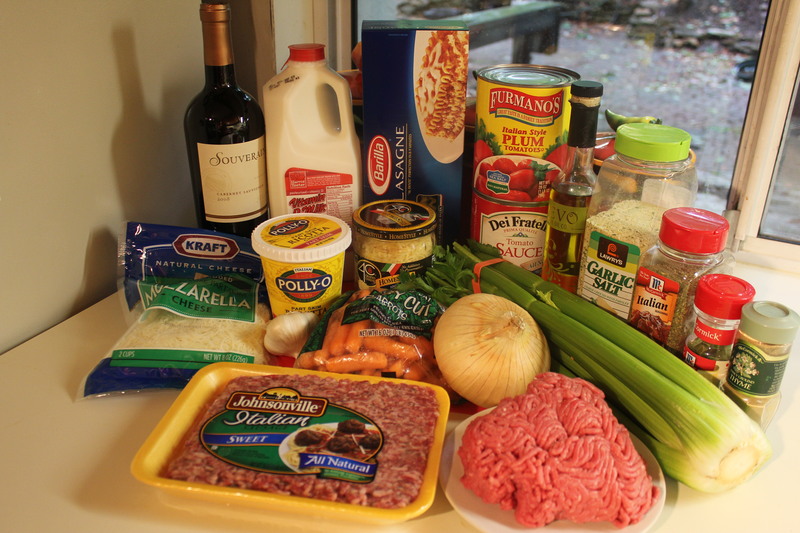 While the meats are cooking, start making the sauce. In a large pot add the plum tomatoes with the juice and break up the tomatoes some with a fork. 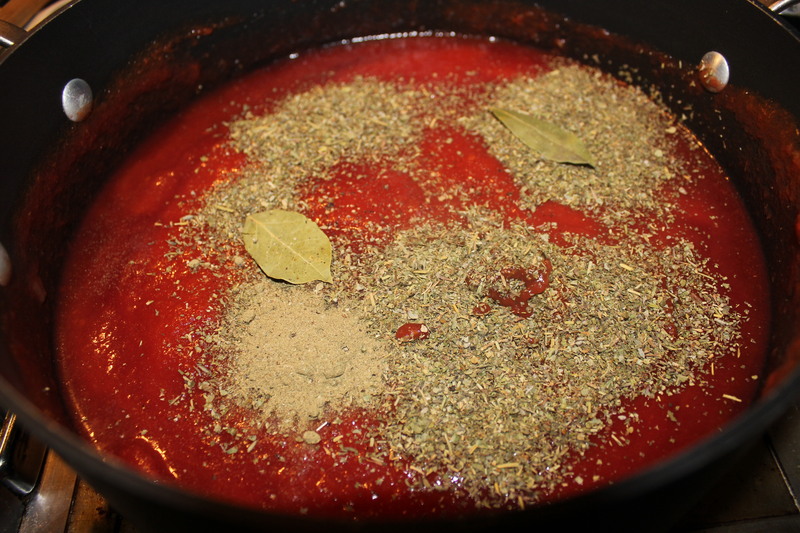 Add the tomato sauce, red wine, Italian seasoning, thyme, bay leaves and sugar and stir. Preheat oven to 350 degrees. 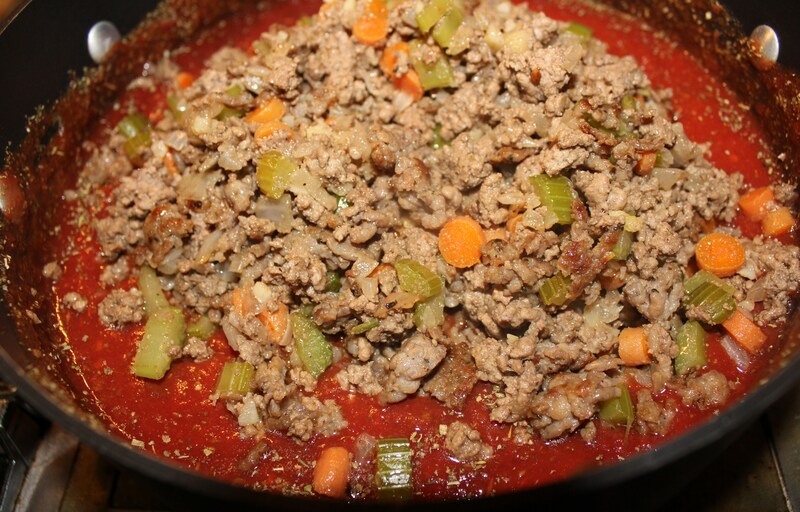 If you made the spaghetti sauce a day or so ahead, remove it from the refrigerator and let it come up to room temperature. 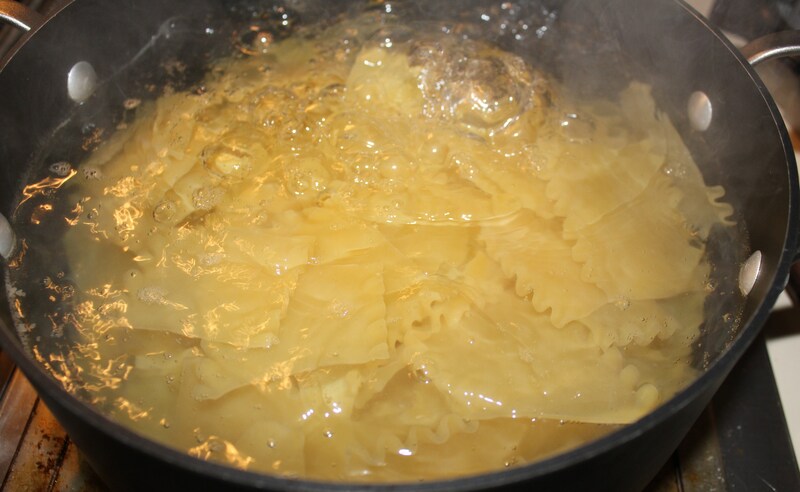 Add the broken lasagna to boiling, salted water and cook for 5 minutes. Drain. In the meantime, melt the butter in a saucepan and slowly add the flour. Mix until smooth, and add the milk, a little bit at a time, constantly stirring until it thickens. 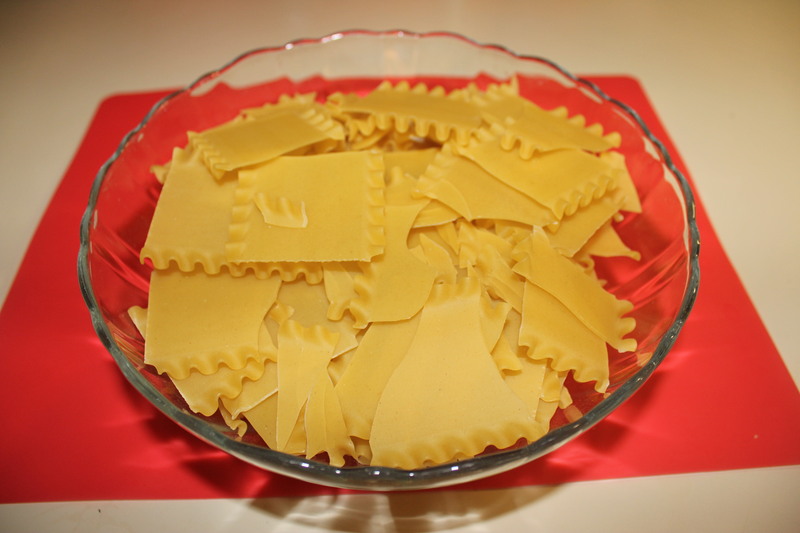 Blend in ¼ cup of the parmesan/reggiano. Season with the fresh nutmeg, salt and pepper. 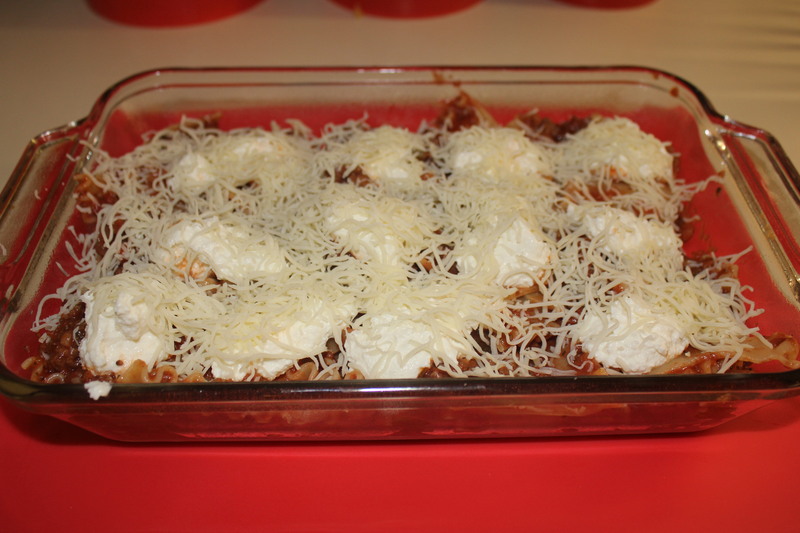 Mix the pasta with the sauce, and add half of it to a greased 9” x 13” casserole dish. Dollop 12 tablespoons or so of the ricotta cheese on the pasta and sauce mixture and then top with the shredded mozzarella. Add the rest of the noodles and sauce. Top with the white sauce, and then sprinkle on the rest of the parmesan/reggiano. I bake this for 25-30 minutes, and then broil it on high for approximately 5 minutes until the top is brown and bubbly. Pair with a tossed salad, some garlic toast and a glass of good red wine. 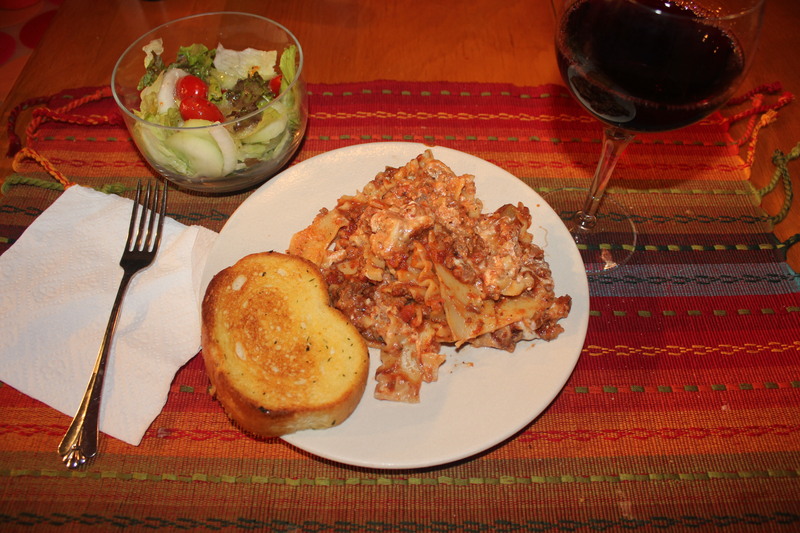 Brad does not share my undying love for lasagna, but he’s not a hater either – he is probably more middle of the road. Not only did he go back for seconds, he happily ate this a few more times during the week! 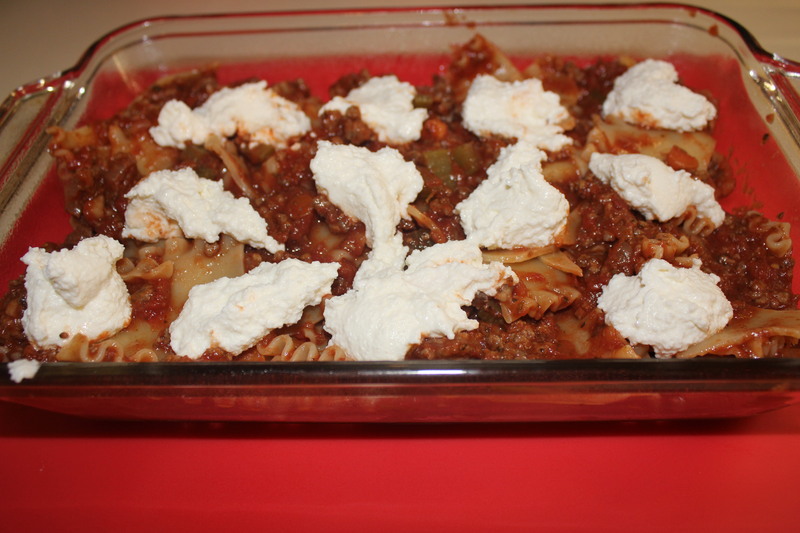 This entry was posted in Meat and Poultry, Pasta, Rice, etc., Recipes and tagged deconstructed lasagna recipe, eat drink and be merry, free-form lasagna recipe, kel's cafe of all things food, Kelley Chisholm blog, Kelley Chisholm recipes, lasagna recipe, Rachael Ray's lazy lasagna, Raleigh food blog. Bookmark the permalink. Instead of using a fork to break the tomatoes, use you (clean) hands. It’s quite therapeutic and is probably faster. Good point, Mandi – I will definitely try that next time.